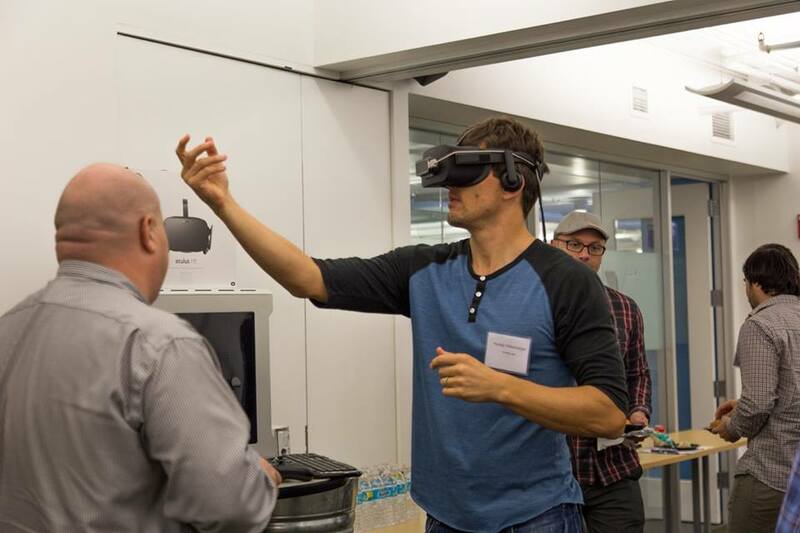 Participants at Collab/Space Chicago 2016 had the opportunity try out VR experiences. Photo by Mel Brunelle. For this year’s Collab/Space Chicago event, we decided to focus on the emerging technology that everyone is buzzing about: virtual reality. We brought in seven innovative startups and projects from media companies – BuzzFeed 360 Video, CNN’s Courageous, Haptical, InContext Solutions, Nvelop Media, Sightpath and Snips Media – to present their work, identify their biggest challenges and then brainstorm solutions in the afternoon. And of course we used improv comedy techniques, facilitated by Andy Boyle, to help the breakout sessions learn to work better together. Here’s a round-up of photos, feedback and a Storify to share the highlights of the event. If we missed anything, let us know and we’ll update the post. Bianca Fortis is the associate editor at MediaShift. Her work has been published in newspapers throughout the country. She was a recipient of the 2011 Scripps Howard Foundation’s Semester in Washington Fellowship and won the 2013 I.F. Stone Award for Emerging Journalists through the Nation Institute. She is a founding member of the Transborder Media storytelling collective. Follow her on Twitter @biancafortis.